If you're anything like me, by now you have barely wrapped your head around the idea that Thanksgiving is around the corner. I've only just now worked my way through my kids' Halloween candy stash and realized that I'm expecting a dozen guests for dinner in a few days. Yikes! I did not grow up celebrating Thanksgiving, and was introduced to the tradition in the early nineties. Young, single and alone in a big and unfamiliar city, I was fortunate enough to be welcomed into a wonderful group of new friends who celebrated with me. So for me, Thanksgiving has always been less about a formal family occasion, and more about a group of people coming together to enjoy each other company – and spend hours of laughter and fun at a festive table. In fact, one of the reasons I chose to make this beautiful country my home was that I felt so unequivocally welcomed by all its inhabitants, regardless of my origins, opinions, or looks. Back to the time crunch though... the old adage “simpler is better” certainly does apply here as well. I've always felt that a simple and natural approach feels both festive and genuine. 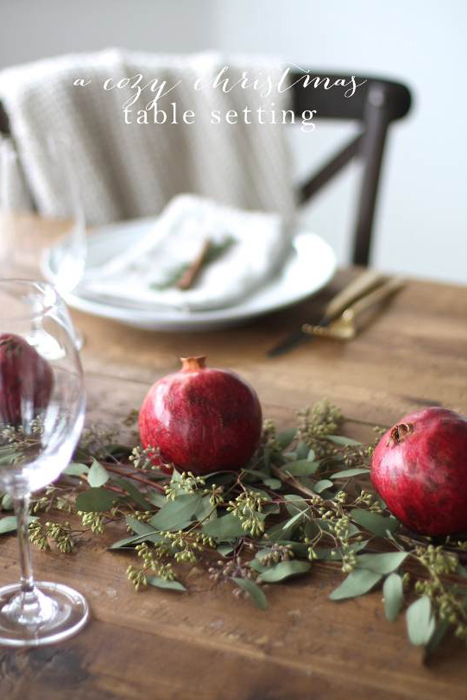 So here are a few quick and simple last-minute Thanksgiving table decorating ideas. By now, I am personally a little over pumpkins - cute as they are - and I have certainly overdosed on the color orange. My solution is to track down a few white pumpkins - you can even paint orange ones with chalk paint - mix them with similarly colors gourds, succulents, berries.... et voilà: a gorgeous tonal fall vignette that feels chic and fresh. If you just can't look at another pumpkin again, consider the pomegranate. Did you know that during their 4000 year history, pomegranates have been symbols of prosperity, hope, and abundance in every part of the world? They have inspired historical leaders, brilliant authors, and famous artists. Their presence has been recorded in history, mythical lore, artistic and literary symbolism, and classic art - so the Thanksgiving table is not a bad spot for pomegranates. 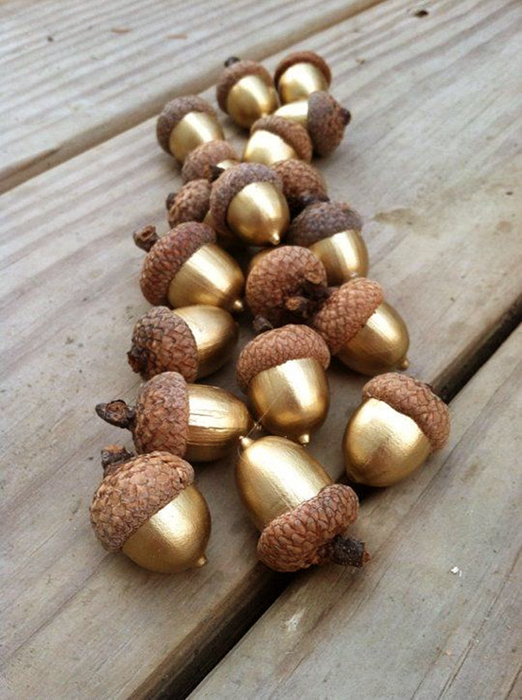 Acorns are among the humblest of autumn's offspring. Gather up a bunch, paint them gold or silver (in a pinch, metallic or glitter nail polish will work too) and scatter them around the table for an instant dose of glam and cheer. Formal flower arrangements feel much too contrived for the Thanksgiving table. 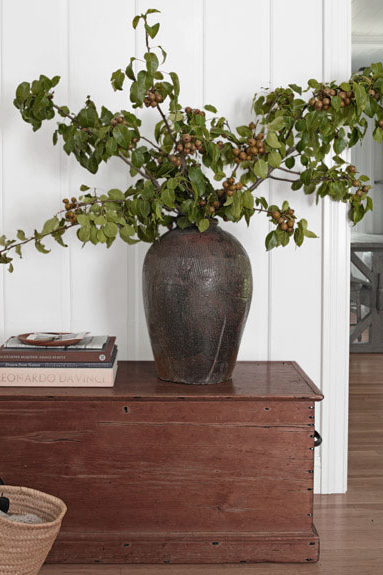 Opt instead for a simple display of seasonal fruit branches such as crab apples, asian pears, or figs. “Branch” out with your vases as well: vintage tin cans, canning jars, harvest baskets and wooden crates are all fun ways to go from garden to table. Since Thanksgiving has its origins in a communal celebration of the autumn harvest, it makes sense to incorporate classic harvest elements such as corn, sheaves of wheat and dried grass. To keep things from looking too “Children of the Corn” (Halloween is behind us after all), keep the containers simple and the arrangements as straightforward as possible. In my house I have personally veto’d anything resembling straw scarecrows, stick figures à la Blair Witch, and Raggedy Ann dolls. 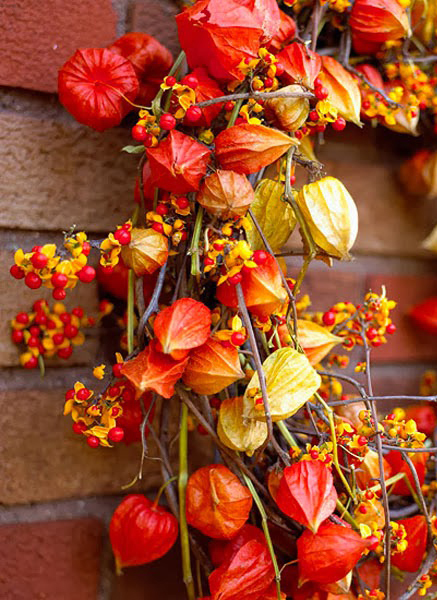 If you're not over orange yet, spruce up your table with the festive Physalis Alkekengi or Chinese Lantern plant which has large inflated seed pods from which the plant gets its common name. Fresh arrangements last about a week, or you can dry the blooms by hanging them upside-down in a dark room for several weeks. Last but not least, there's the Lunaria, also known as the Silver Dollar or Money Plant. The Pilgrims brought them to the colonies on the Mayflower, and Thomas Jefferson grew them in the famous gardens of Monticello and mentioned them in his letters. 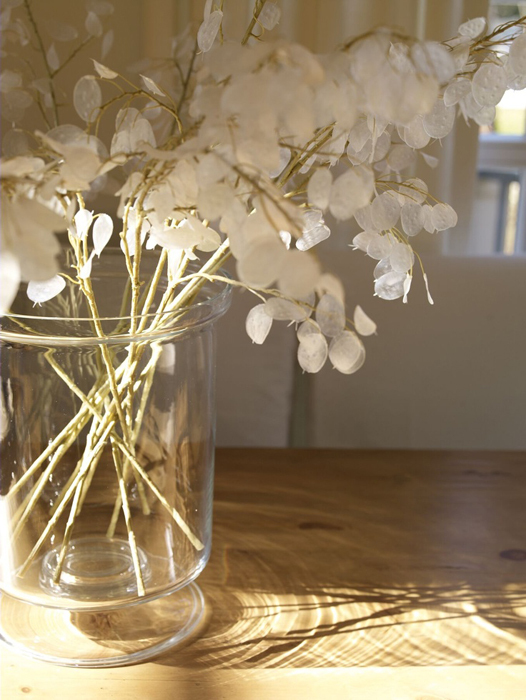 The pods on its delicate branches dry to flat silver discs which reflect and filter the light beautifully, for a truly magical holiday table. And on that note, I'd like to wish you all a happy and cozy Thanksgiving holiday, filled with laughter and joy!